Kevin O' Brien, Alex Cusack and Max Sorensen are having a loaf. TRENT JOHNSON MAY have retired but John Mooney and the O’Brien brothers are still around so Johnson, Mooney & O’Brien have renewed their partnership Cricket Ireland for a further two years. It’s a busy time for Ireland’s cricketers with the women recently in Qatar playing in an international tri-series with South Africa and Pakistan ahead of their first ever ICC World Twenty20 in March. Meanwhile the men are about to embark on a month long tour of the West Indies, followed by the ICC World Twenty20, and of course 2015 sees Ireland play in their third consecutive World Cup in Australia and New Zealand. “Johnston, Mooney and O’Brien initially got involved because of the heroic efforts of the players against England. We are extremely pleased to have them stay on as sponsor past Trent Johnson’s retirement, highlighting a belief in the Cricket Ireland story and the growing number of fans and players alike. “It is great to have the support of an Irish company like Johnston Mooney & O’Brien, who share as rich a tradition and heritage in this country as Irish cricket.”’ said Cricket Ireland Head of Commercial, Dennis Cousins. 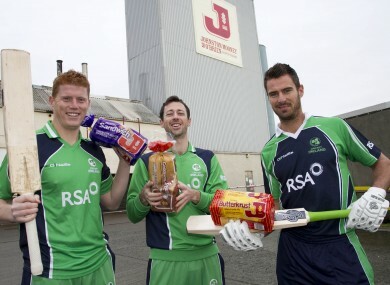 Email “Snapshot: Irish cricket continues to be the best thing since sliced bread”. Feedback on “Snapshot: Irish cricket continues to be the best thing since sliced bread”.